Endowed with an impressive interior to match its equally dazzling exterior, the new Imperiale Tourbillon Joaillerie embodies a concentrated blend of watchmaking and jewellery expertise – Chopard’s twin domains of excellence. 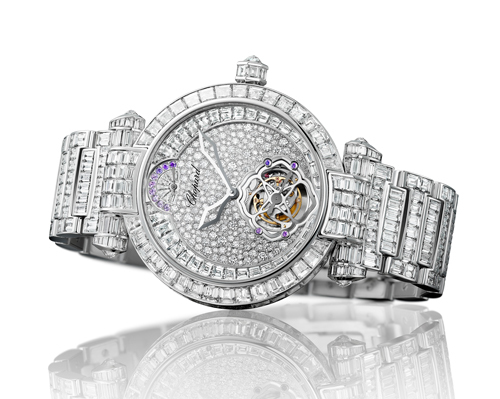 Its chronometer-certified tourbillon calibre bearing the Poinçon de Genève quality hallmark is housed within an 18-carat case and dial entirely set with diamonds and illustrating almost the entire range of gem-setting techniques. 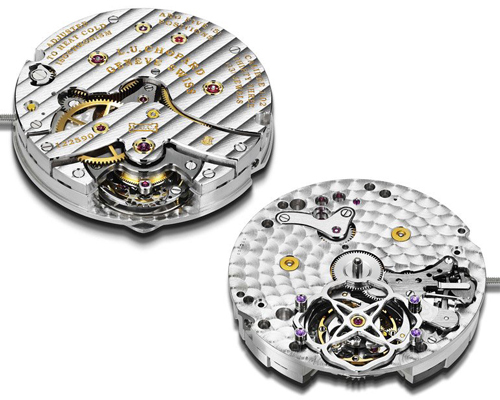 Chopard clearly preferred not to choose between making this a watch or a jewellery creation. The new Imperiale Tourbillon Joaillerie crystallises the full measure of the brand’s expertise in the two fields on which it has built its reputation. The breathtaking gem-setting work is a virtuoso demonstration of jewellery-making skills; while the L.U.C 02-14-L movement entirely designed, developed and crafted in hand is equipped with a tourbillon, a complication rarely seen on ladies’ models. The overall result is a blend of Haute Joaillerie and Haute Horlogerie that sets a new benchmark in the field of complicated feminine watches. the small seconds visible on the 1-minute tourbillon visible at 6 o’clock, as well as a power-reserve indicator magnificently highlighted at 12 o’clock in an arc set with baguette-cut diamonds and amethysts. The 18-carat white gold is set using the snow setting technique, which is particularly hard to master because it combines brilliant-cut diamonds of varying diameters. 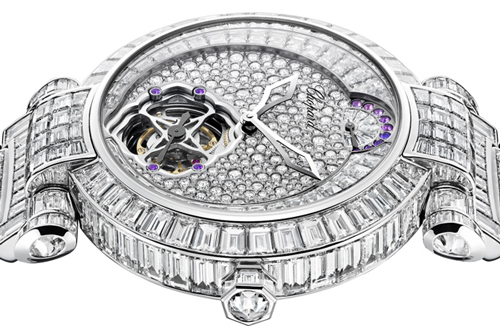 It is also adorned with a row of baguette-cut diamonds and a power-reserve indicator set with amethysts. The white gold crown features baguette- and briolette-cut diamonds, while oval-cut cabochons and baguette-cut diamonds adorn the bezel, lugs and bracelet. 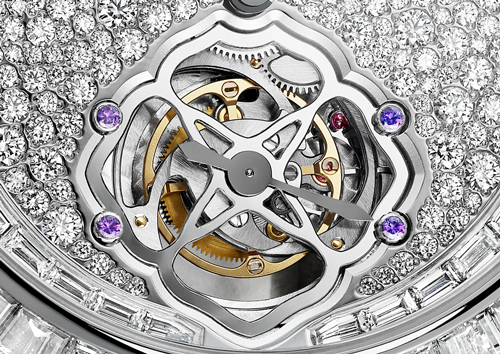 Finally, at 6 o’clock, surrounded by amethysts set amid an ocean of white lights, the tourbillon bridge reflecting the distinctive motif of the Imperiale collection is held in place by four screws with amethyst-set heads – a refined detail representing yet another unique characteristic.